War is unending in the life of a Space Marine. After defeating tau forces, Captain Uriel Ventris of the Ultramarines has returned to the Chapter’s homeworld of Macragge, but there is little respite. The Ultramarines are thrust back into battle, and this time the enemy is the Chapter’s greatest nemesis. The traitorous Iron Warriors, led by renegade Warsmith Honsou, have gathered together a massive and brutal warband. Their target is the realm of Ultramar. Their objective is total annihilation. 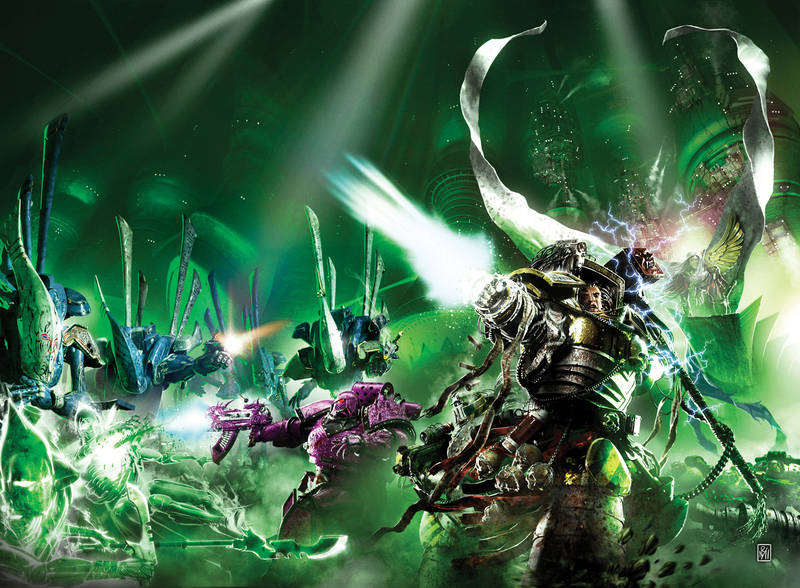 It is a final showdown between legendary Space Marines, and Uriel Ventris must take on the might of Honsou if he is to save his Chapter’s homeworld. This was a biggie. Going into the project, we knew that it would be larger than most novels, since it’s an entire Chapter at War. The Ultramarines books had been growing steadily in scope, with The Killing Ground dealing with just the two Ultramarines warriors, Courage and Honour with the company. Now the Chapter’s Due would deal with almost all the Chapter. This was the end of the latest three-book arc, and as such it needed to be big. I’d established the bad guys route to this point in a few short stories and the Iron Warrior novella, but this was where it all had to pay off. I’d spent a lot of time planning this out, and knew there would be a hell of a lot of work in planning out how to tell a multi-system wide invasion. I brought back some characters from a previous novel, and introduced some new ones (Raven Guard and Inquisition) The big guns were going to come out to play in this novel, as you couldn’t very well have such a big invasion where the Special Characters sit on the sidelines. Hence Marneus Calgar, Tigurius et al were going to have to take to the pages. Getting to play with the big toys is a lot of fun, but it’s also a big responsibility, as these are characters to whom players can feel a sense of ownership. They can use these guys in their game, and they have their own perception of how they should be portrayed. Kind of like the Horus Heresy books, with the exception that these guys have rules, models and you can see them on the tabletop. I also got to use some of the characters Nick Kyme had created for the Assault on Black Reach novella, and as he was my editor on this, I really had to get them right. I decided on three main threads of battle, each with a different flavour and each with a very different series of characters. This allowed me to flip between the various battles, moving time on and telling different kinds of story within those battles. So we have Calgar and Tigurius holed up in an ancient fortress besieged by daemons, Scipio and the warriors of the 2nd Company going behind the lines, and Uriel and Pasanius defending Calth from the Iron Warriors and Honsou himself. The novels of the Ultramarines had been largely confined to just Uriel and Pasanius, but this story continued a process I’d begun in Courage and Honour, where I was going to broaden the canvas of characters. These books would be Ultramarines novels, not just a Uriel and Pasanius story. Those two would still form the focus of the stories, but I’d have a bigger toybox to play with. That’s why we see more of the Chapter, more of the 4th Company and more of Uriel’s command squad. Expect to see more of these guys in the future. Uriel and Pasanius had come full circle. They’d broken with their Chapter, paid the price and seen where such breaches of faith would lead. They’d done their penance on the battlefield and on the way home, and now it was time to rejoin their Chapter as fully paid up members of the Ultramarines. It was also the novel that drew a parallel storyline to a close, so it had to be big and it had to be satisfying. Honsou had built up quite a following along the way too, so I needed to satisfy his fans as well as the Ultramarines ones. As one of the main characters, Honsou needed plenty of screen time, yet I still needed to remember that this was an Ultramarines novel. Uriel and the boys in blue still needed the lion’s share of the novel. As the final book in this arc, there needed to be elements of closure to some of the plot lines I’d built up, and I think the book does a neat job of tying up enough loose ends to satisfy, while still leaving enough options for dangling threads to be pulled at a later date. This was a novel that surprised me, as a great deal of it didn’t turn out the way I intended it to, as the characters kept surprising me along the way. The ending I had planned was a lot different, but an idea occurred to me as I was writing the big battle at the end, and I had to go away and think about it for a while, as it seemed too strange and unusual to work. But the more I thought about it, the more I liked it and the more it neatly tied the endings together and made a more satisfying ending than the one I had originally planned. As anyone who’s ever asked me about writing a synopsis can testify, I always say you need a robust plot, but one with enough flex in it to accommodate any changes that make themselves known along the journey. This was just such an occasion, and I think it’s a better book because of it.